Bodtger, U., et al. Solitary Fibrous Tumour of the Pleura and Paraneoplastic Symptoms: A Case Report and Literature Review. (2017) Int J Cancer Oncol 4(2): 1-5. © 2017 Bodtger, U. This is an Open access article distributed under the terms of Creative Commons Attribution 4.0 International License. Background: Solitary fibrous tumors of the pleura (SFTP) are rare neoplasms deriving from mesenchymal cells. They are mostly benign and may be accompanied by paraneoplastic syndromes, particularly hypoglycaemia and hypertrophic pulmonary osteoarthropathy (HPO). Methods: A Case Report of a patient with HPO preceding respiratory symptoms secondary to a huge SFTP which was surgically removed and found benign. A literature search was conducted on PubMed using the MeSH terms: secondary hypertrophic osteoarthropathy, solitary fibrous tumor, and solitary fibrous tumor of the pleura. Searches were limited to abstract, full text and English language. Articles from 1946 to 2016 were browsed and relevant articles extracted and reviewed. Results: Our case patient experienced only partial remission of HPO despite benign histology and no signs of recurrence 3 years after surgery. This is in contrast to the literature. This report reviews the various mechanisms suggested to be involved in development of HPO: the humoral, immunologic, and neurogenic theory. Conclusion: SFTP has almost all characteristics for development of HPO but all these resolves after surgical resection. Recurrence of HPO is thus indicative of SFTP recurrence, which must be explored thoroughly. Solitary fibrous tumours derive from mesenchymal cells. First described and most commonly found in the pleura, they have later been shown to appear in several other extra pleural sites. Solitary fibrous tumours of the pleura (SFTP) are mostly benign and may be accompanied by paraneoplastic syndromes (PNS), particularly hypoglycaemia and Hypertrophic Osteoarthropathy (HOA). Development of HOA secondary to pulmonary disease is termed Hypertrophic Pulmonary Osteoarthropathy (HPO) and is seen in as many as 47% of patients affected by both malignant and benign SFTP. While excessive IGF-II production is thought to cause reactive hypoglycaemia, the exact mechanism behind HPO appears to be more enigmatic. Our case-report describes a case of benign SFTP associated with – and preceded by – a PNS manifestation of HPO. We aimed at elucidating the possible mechanisms in PNS in benign pulmonary neoplasia. A Case Report is presented. A literature search was conducted on PubMed using the MeSH terms: secondary hypertrophic osteoarthropathy, solitary fibrous tumour, and solitary fibrous tumour of the pleura. Searches were limited to abstract, full text and English language. Articles from 1946 to 2016 were browsed, and relevant articles extracted and reviewed. The reference sections of included papers were searched as additional literature searching. A 43-year-old Caucasian female was referred to department of internal medicine by her general practitioner in March 2014, to rule out rheumatic disease due to symptoms from her locomotor system. Onset of symptoms started three years earlier when she experienced intermittent pain and swelling from knees, ankles and toes. Eight months prior to referral, she developed symmetrical clubbing of fingernails, monthly night sweats and malaise, but no weight loss or dyspnoea. She was a never-smoker, and the medical history was unremarkable. A chest x-ray performed in 2013 was described as “non-specific changes in the left hemithorax” (Figure 1), but a follow-up was never performed due to miscommunication. 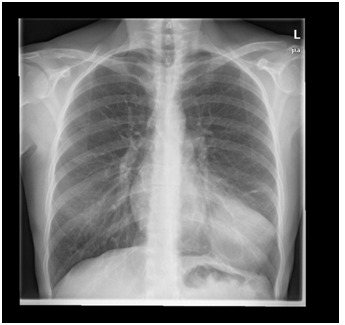 Figure 1: Initial chest x-ray from 2013 with a mass (arrow) interpreted as “non-specific findings” in left hemithorax. At presentation, she had no signs of acute or chronic respiratory failure. Alkaline phosphatase levels were elevated, and she was suspected of having disseminated lung cancer. A contrast-enhanced chest CT revealed a large tumour (14 cm x 8 cm x 10 cm) in the left hemithorax with possible pleural origin and partial atelectasis of surrounding lung tissue. A PET-CT revealed inhomogeneous and slightly increased FDG-uptake corresponding to the pleural lesion basally (Figure 2). No other abnormal lesions were identified. A bone scintigraphy was normal. 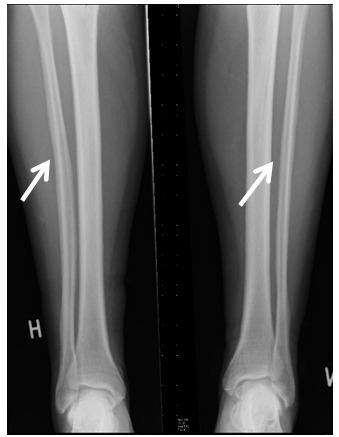 X-rays of upper and lower extremities revealed non-specific focal thickening of the periosteum of the right ulna and both fibulae, interpreted as HPO (Figure 3). An ultrasound guided, transthoracic needle aspiration biopsy showed fibrous connective tissue, focally with chronic inflammation, with no premalignant or malignant changes. These findings coincided well with a solitary fibrous tumour of the pleura. A confirmatory diagnosis of a benign SFTP was made after pathological examination of the resected tumour: positive stains to CD34, CD99, Bcl-2 and Vimentin, but negative to S-100, Calretinin and Actin. 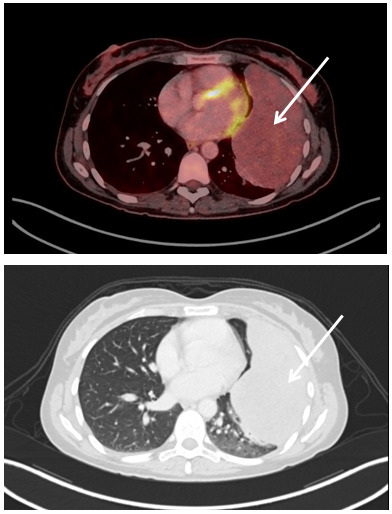 Figure 2: FDG-PET-scan (upper) And CT-scan (lower) demonstrating left sided solid pleural mass (arrows) with low FDG-uptake. Figure 3: X-ray showing non-specific periosteal thickening (arrows) of the right (H) and left (V) fibulae. Following surgery, the patient initially reported complete remission of all symptoms. Follow-up was performed in January 2016 with a chest CT without any signs of residual tumor or metastases (Figure 4). Patient reported a few weeks of bone pain identical to that experienced prior to diagnosis of SFTP two years earlier. A PET-CT scan was completely without signs of recurrence or development of other pathological lesions including peritoneum and pericardium. She had no signs of vagal dysfunction. Blood alkaline phosphatase levels were normal, but blood sugar, HbA1c and X-ray imaging of upper and lower extremities were without remission. A multidisciplinary team conference involving thoracic surgeon, chest physician, radiologist and pathologist concluded that there were no signs of relapse, and that the patient should continue routine follow-up with chest CT and blood samples annually. She was referred for evaluation by a rheumatologist but the patient cancelled the appointment as the bone pain resolved spontaneously within 6 weeks. At follow-up in February 2017, she was completely asymptomatic, with normalized blood samples including HbA1c and her CT were without any signs of relapse. 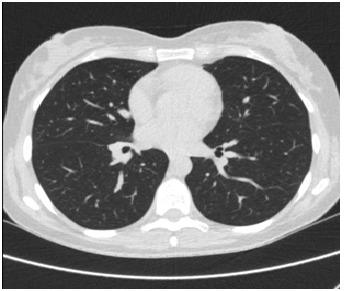 Figure 4: Follow-up chest CT scan at 24 months showing without residual tumor. Previously thought to be localized mesotheliomas, electron microscopy, flow cytometry and immunohistochemical analysis has revealed SFTP to develop from sub mesothelial mesenchymal cells. SFTP constitute less than 5% of all primary pleural neoplasms, and population incidence has been estimated from 1.4 per million individuals to 2.8 per 100.000[5,6]. Radiological examination display SFTP as well-defined, smooth, heterogeneous masses, usually occurring in the middle or inferior hemithorax. Roughly 80% arise from the visceral and 20% from the parietal pleura. Tumours demonstrating high cellularity, high mitotic activity, haemorrhage, necrosis and significant cellular pleomorphism, are classified as malignant, based on criteria established by England et al. Even though SFTP is predominantly a benign, slow growing tumour, one in six resected tumours is malignant. Consequently, en bloc resection is the preferred treatment of all tumors. Typically, benign tumours measure < 10 cm, are pedunculated and originate from the visceral, pleura; malignant forms tend to be larger, sessile masses arising from the parietal pleura of the mediastinum or diaphragm[10-12]. In a retrospective review including 84 patients, the median age was 57 years (range 34 - 83 years). Other studies similarly show a wide age range, with peak incidences occurring in the sixth and seventh decade of life, affecting males and females fairly equally[10,12-14]. Aetiology remains enigmatic and there seems to be no known association with tobacco or asbestos exposure, nor any known inherited predisposition. SFTP is symptomatic at time of diagnosis in roughly 60% of benign, and 75% of malign cases. Symptoms are unspecific, and relates to local discomfort (e.g. cough, dyspnoea, or chest pain) and systemic, paraneoplastic symptoms (e.g. weight loss, nocturnal sweating, and fatigue). Notably, both benign and malignant SFTPs may cause PNS, most commonly hypoglycaemia (Doege-Potter syndrome; incidence < 5%), and HPO (Marie-Bamberg syndrome; incidence 2 - 47%)[3,10]. The PNS are usually completely reversible within 2 - 5 months after tumour resection. Hypertrophic osteoarthropathy is a rheumatologic disorder haracterized by clubbing of the fingers, symmetric polyarthritis, joint effusions, cutaneous changes, and painful proliferative periostitis of the long bones. The primary form of HOA (pachydermo periostitis) remains a rare familial, autosomal dominant disorder and is seen with acromegalic features. HOA most commonly develop as a secondary manifestation of internal pathologies, with intrathoracic neoplasms accounting for approximately 80% of cases. HOA secondary to pulmonary disease is termed hypertrophic pulmonary osteoarthropathy and was separately described by Eugen von Bamberger in 1889, and Pierre-Marie in 1890 (Marie-Bamberg syndrome). Remaining causes include various systemic pathologies such as vasculitis, hepato-pulmonary syndrome, cyanotic heart disease, pulmonary infections, renal failure, abdominal pathologies, sleep apnoea, and others[17,31]. In secondary HOA, skeletal changes, joint swelling and joint pain predominate over cutaneous manifestations, which are more common in the inherited form. X-ray examination typically shows periosteal membrane thickening and periosteal new bone formation, while Tc-99m-phosphate scintigraphy usually shows bilaterally increased uptake in the distal long bones[15-20]. Paraneoplastic HPO tends to progress rapidly and the pain is severe. Removal of the primary tumour often results in complete regression of the HPO, which implies that it truly is of paraneoplastic origin. The exact mechanisms of HOA remain puzzling. Table 1 lists the dominating hypotheses, which are not mutually exclusive. The Megakaryocytic theory (Dickinson and Martin, 1987) suggests that megakaryocytes bypassing the pulmonary microvasculature become embedded in systemic capillaries where they activate endothelial cells via production of platelet-derived growth factor (PDGF), contributing to development of clubbing seen in HOA via fibroblast proliferation, vascular hyperplasia, and new bone formation. In a similar manner, the Humoral theory proposed as early by Pierre-Marie in 1890 (‘De l’osteo-arthropie hypertrophiante pneumique’ in Revue de Medecine) suggests that PNS-related HOA is caused by circulating factors released directly into the systemic circulation, i.e. by the tumor itself. Vascular endothelial growth factor, prostaglandin E2, transforming growth factor beta-1, epidermal growth factor, growth hormone-releasing hormone, and interleukin-11 are some of the suspected humoral agents that have been shown to play a role in development of HOA[23-228]. Fibrous tumours in general are associated with a high HPO prevalence, suggesting that the specific histology imply specific traits associated with developing HOA/HPO. Geoffrey Flavell proposed the Neurogenic theory (1953) after performing vagectomy in patients with HPO and unresectable bronchial carcinoma. He described immediate reversal of skeletal symptoms, and suggested that HPO was caused by neural reflexes passing from the affected lung via the vagus nerve. Bazar et al. later suggested that vagal fibres normally provide a protective function, disturbed by tumor-caused sympathetic activity. Local hypoxia is common in pleural or pulmonary neoplasms, and could possibly cause sympathetic bias in tumour adjacent areas via stimulation of peripheral chemoreceptors. Additionally, increased sympathetic activity is shown to inhibit Th1 lymphocyte responses, which are crucial in inducing programmed cell death in cancer cells. HPO is not uncommon in neither benign nor malignant SFTP which might be explained by large slow-growing lesions – despite benign or malignant differentiation - in the vagal area (neurogenic theory) with alterations in tumor vascularity (megakaryotic theory) and local, neoplastic productions of active, humoral factors (humoral theory). However, none of these conditions are present after complete surgical resection. Absence of clinical remission suggests recurrence of SFTP. Here, we present a case report on benign SFTP with complete radiological and partial clinical remission at 2-years follow-up, and complete remission at 3-years follow-up. The authors have stated that they have no conflict of interest. 1. el-Naggar, A.K., Ro, J.Y., Ayala, A.G., et al. Localized fibrous tumor of the serosal cavities. Immunohistochemical, electron-microscopic, and flow-cytometric DNA study. (1989) Am J Clin Pathol 92(5): 561-565. 2. Demicco, E.G., Park, M.S., Araujo, D.M., et al. Solitary fibrous tumor: a clinicopathological study of 110 cases and proposed risk assessment model. (2012) Mod Pathol 25(9): 1298-1306. 3. Briselli, M., Mark, E.J., Dickersin, G.R. Solitary fibrous tumors of the pleura: eight new cases and review of 360 cases in the literature. (1981) Cancer 47(11): 2678-2689. 4. Tsuro, K., Kojima, H., Okamoto, S., et al. Glucocorticoid therapy ameliorated hypoglycemia in insulin-like growth factor-II-producing solitary fibrous tumor. (2006) Intern Med 45(8): 525-529. 5. Okike, N., Bernatz, P.E., Woolner, L.B. Localized mesothelioma of the pleura: benign and malignant variants. (1978) J Thorac Cardiovasc Surg 75(3): 363-372. 6. Thorgeirsson, T., Isaksson, H.J., Hardardottir, H., et al. Solitary Fibrous Tumors of the Pleura: An Estimation of Population Incidence. (2010) Chest 137(4): 1005-1006. 7. Supakul, R., Sodhi, A., Yshii Tamashiro, Cecilia., et al. Solitary Fibrous Tumor of the Pleura: A Rare Cause of Pleural Mass. (2015) Am J Case Rep 16: 854-857. 8. England, D.M., Hochholzer, L., McCarthy, M.J. Localized benign and malignant fibrous tumors of the pleura. A clinicopathologic review of 223 cases. (1989) Am J Surg Pathol 13(8): 640-658. 9. Robinson, L.A. Solitary fibrous tumor of the pleura. (2006) Cancer Control 13(4): 264-269. 10. Lahon, B., Mercier, O., Fadel, E., et al. Solitary fibrous tumor of the pleura: outcomes of 157 complete resections in a single center. (2012) Ann Thorac Surg 94(2): 394-400. 11. Cardillo, G., Facciolo, F., Cavazzana, A.O., et al. Localized (solitary) fibrous tumors of the pleura: an analysis of 55 patients. (2000) Ann Thorac Surg 70(6): 1808-1812. 12. Harrison-Phipps, K.M., Nichols, F.C., Schleck, C.D., et al. Solitary fibrous tumors of the pleura: results of surgical treatment and long-term prognosis. (2009) J Thorac Cardiovasc Surg 138(1): 19-25. 13. Lococo, F., Cesario, A., Cardillo, G., et al. Malignant solitary fibrous tumors of the pleura: retrospective review of a multicenter series. (2012) J Thorac Oncol 7(11): 1698-1706. 14. Kanaji, N., Watanabe, N., Kita, N., et al. Paraneoplastic syndromes associated with lung cancer. (2014) World J Clin Oncol 5(3): 197-223. 15. Kumar, S., Sidhu, S., Mahajan, B.B. Touraine-soulente-gole syndrome: a rare case report and review of the literature. (2013) Ann Dermatol 25(3): 352-355. 16. Yao, Q., et al. Periostitis and hypertrophic pulmonary osteoarthropathy: report of 2 cases and review of the literature. (2009) Semin Arthritis Rheum 38(6): 458-466. 17. Segal, A.M., Mackenzie, A.H. Hypertrophic osteoarthropathy: a 10-year retrospective analysis. (1982) Semin Arthritis Rheum 12(2): 220-232. 18. Cannavo, S.P., Guarneri, C., Borgia, F., et al. Pierre Marie-Bamberger syndrome (secondary hypertrophic osteoarthropathy). (2005) Int J Dermatol 44(1): 41-42. 19. Yang, W.C., Lin, S.C., Liu, T.C., et al. Clubbed fingers and hypertrophic osteoarthropathy in a patient with squamous cell carcinoma of the lung. (2003) Kaohsiung J Med Sci 19(4): 183-187. 20. Poanta, L., Parasca, I., Fazakas, E., et al. Paraneoplastic hypertrophic osteoarthropathy: evaluation at 25 years after pneumectomy. (2009) Pol Arch Med Wewn 119(9): 603-606. 21. Dickinson, C.J., Martin, J.F. Megakaryocytes and platelet clumps as the cause of finger clubbing. (1987) Lancet 2(8573): 1434-1435. 22. Olan, F., Portela, M., Navarro, C., et al. Circulating vascular endothelial growth factor concentrations in a case of pulmonary hypertrophic osteoarthropathy. Correlation with disease activity. (2004) J Rheumatol 31(3): 614-616. 23. Kozak, K.R., Milne, G.L., Morrow, J.D., et al. Hypertrophic osteoarthropathy pathogenesis: a case highlighting the potential role for cyclo-oxygenase-2-derived prostaglandin E2. (2006) Nat Clin Pract Rheumatol 2(8): 452-456. 24. Atkinson, S., Fox, S.B. Vascular endothelial growth factor (VEGF)-A and platelet-derived growth factor (PDGF) play a central role in the pathogenesis of digital clubbing. (2004) J Pathol 203(2): 721-728. 25. Hirakata, Y., Kitamura, S. Elevated serum transforming growth factor beta 1 level in primary lung cancer patients with finger clubbing. (1996) Eur J Clin Invest 26(9): 820-823. 26. Mito, K., Maruyama, R., Uenishi, Y., et al. Hypertrophic pulmonary osteoarthropathy associated with non-small cell lung cancer demonstrated growth hormone-releasing hormone by immunohistochemical analysis. (2001) Intern Med 40(6): 532-535. 27. Milman, E., Berdon, W.E., Garvin, J.H., et al. Periostitis secondary to interleukin-11 (Oprelvekin, Neumega). Treatment for thrombocytopenia in pediatric patients. (2003) Pediatr Radiol 33(7): 450-452. 28. Yacoub, M.H., Simon, G., Ohnsorge, J. Hypertrophic pulmonary osteoarthropathy in association with pulmonary metastases from extrathoracic tumours. (1967) Thorax 22(3): 226-231. 29. Flavell, G. Reversal of pulmonary hypertrophic osteoarthropathy by vagotomy. (1956) Lancet 270(6911): 260-262. 30. Bazar, K.A., Yun, A.J., Lee, P.Y., et al. Hypertrophic osteoarthropathy may be a marker of underlying sympathetic bias. (2004) Med Hypotheses 63(2): 357-361. 31. Brown, J.M. Tumor hypoxia in cancer therapy. (2007) Methods Enzymol 435: 297-321. 32. Joon Yun, A., Bazar, K.A., Lee, P.Y., et al. Tumors may modulate host immunity partly through hypoxia-induced sympathetic bias. (2004) Med Hypotheses 63(2): 352-356.